TLJ News: September 6-10, 2012. 9/10. The Federal Communications Commission (FCC) filed its brief [121 pages in PDF] with the U.S. Court of Appeals (DCCir) in Verizon v. FCC, the challenge to the FCC's 2010 rules that regulate the business practices of broadband internet access service (BIAS) providers. These rules are also sometimes referred to as open internet rules or network neutrality rules. Unfortunately for the FCC and DOJ lawyers briefing and arguing this case, the task of the Court of Appeals is not to determine whether its BIAS regulation would make sound legislative policy. That is a determination for the Congress, and one which the Congress has not yet made. Rather, the question before the Court of Appeals is whether the FCC has statutory authority to write these rules. This brief grasps for legal authority to write these rules in various statutory sections, but places the most emphasis on Section 706. This brief squirms to get out from under the weight of this same Court's 2010 opinion in the Comcast case, in which this Court held that the FCC cannot do by adjudication what it now seeks to do by rules. The FCC now argues that this case is different, because since the Comcast case was decided the FCC has produced new and different Section 706 reports. 9/10. The Senate Judiciary Committee (SJC) released a revised agenda for its executive business meeting on Thursday, September 13, 2012. This agenda includes a bill regarding video viewing on social media, the Patent Law Treaties Implementation Act, a bill to give copyright protection to fashion designs, and the William Baer nomination. The SJC added to the agenda consideration of HR 2471 [LOC | WW], a bill to amend 18 U.S.C. § 2710 regarding video tape privacy and social media. It also added S 3486 [LOC | WW], the "Patent Law Treaties Implementation Act". It also added S 3523 [LOC | WW], the "Innovative Design Protection Act of 2012". Finally, the SJC added consideration of the nomination of William Baer to be Assistant Attorney General in charge of the Department of Justice's (DOJ) Antitrust Division. The SJC rarely follows its agendas in full. The SJC, which usually meets every Thursday at 10:00 AM when the Senate is in session, often holds over consideration of items the first few times that they are on the agenda. Hence, the SJC may not actually take up all, or any, of these items on September 13. However, any items not taken up on September 13 are likely to be considered within a few weeks. Judge Bork, Video Privacy, and Social Media. HR 2471 would amend the "Video Privacy Protection Act" or VPPA, which was enacted by the 100th Congress in 1988 just after the public debates and Senate hearings pertaining to the nomination of Judge Robert Bork to be a Justice of the Supreme Court, which involved public disclosure of his video rental records. That bill was Public Law No. 100-68. It is codified at 18 U.S.C. § 2710. Rep Bob Goodlatte (R-VA) introduced HR 2471 on July 8, 2011. The HJC amended and approved this bill on October 13, 2011. See, story titled "House Judiciary Committee Passes Bill to Ease User Disclosure of Video Viewings in Social Media" in TLJ Daily E-Mail Alert No. 2,307, October 13, 2011. The House passed it on December 6, 2011. This bill would amend Section 2710 to provide that "A video tape service provider may disclose personally identifiable information concerning any consumer ... to any person with the informed, written consent (including through an electronic means using the Internet) in a form distinct and separate from any form setting forth other legal or financial obligations of the consumer given at one or both of the following times -- (i) the time the disclosure is sought; and (ii) in advance for a set period of time or until consent is withdrawn by such consumer". Patent Law Treaties Implementation Act. 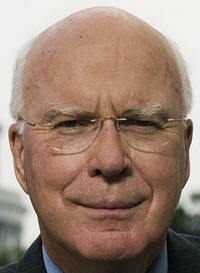 Sen. Patrick Leahy (D-VT) and Sen. Charles Grassley (R-IA) introduced S 3486 on August 2, 2012. This bill would implements two patent law treaties, the "Hague Agreement Concerning International Registration of Industrial Designs" and "Patent Law Treaty". The Senate ratified these treaties in 2007. Sen. Leahy (at right) stated in the Senate on August 2 that the Hague Agreement "provides a simplified application system for U.S. creators of industrial designs who, by filing a single standardized application for a design patent at the U.S. Patent and Trademark Office, can apply for design protection in each country that has ratified the Treaty." See, Congressional Record, August 2, 2012, at Page S5980. "American design patent applicants who previously had to file separate applications in numerous countries may now file a single, English-language application at the U.S. Patent Office, reducing the costs and burdens of obtaining international protections. The U.S. Patent Office may also receive applications that have been filed internationally, but its substantive examination process remains unchanged." Sen. Leahy also stated that the Patent Law Treaty "streamlines the process for American businesses seeking patent protection overseas. It limits the formalities different countries can require in patent applications, which are often used to disadvantage American applications in foreign jurisdictions. American businesses and inventors will benefit from harmonized applications, reducing the cost of doing business and encouraging U.S. innovators to protect and export their products internationally." Copyright Protection for Fashion Designs. Sen. Charles Schumer (D-NY) introduced S 3523 on September 10, 2012. This is a reintroduction of a related bill from the 111th Congress, S 3728 [LOC | WW], the "Innovative Design Protection and Piracy Protection Act". Sen. Schumer introduced that bill on August 5, 2010. The SJC amended and approved it on December 1, 2010, during the lame duck session. See, story titled "Senate Judiciary Committee Approves Bill to Give Copyright Protection to Fashion Designs" in TLJ Daily E-Mail Alert No. 2,166, December 2, 2010. However, the full Senate did not pass it. 9/10. The House Rules Committee (HRC) adopted a rule for consideration of HR 5949 [ LOC | WW], the "FISA Amendments Act Reauthorization Act of 2012". This rule does not make in order any amendments. The House is scheduled to consider this bill on Wednesday, September 12, 2012. House Democrats submitted three amendments to the HRC. First, there was an amendment offered by Rep. John Conyers (D-MI) and others that would shorten the extension. Second, there was an amendment offered by Rep. Jerrold Nadler (D-NY) and Rep. Jan Schakowsky (D-IL) that would require the Attorney General to publish an unclassified summary of each FISA body opinion that includes a significant construction or interpretation of Section 702. Third, there was an amendment offered by Rep. Bobby Scott (D-VA) that would expand Congressional reporting requirements. All three of these proposals were considered and debated, but rejected, when the House Judiciary Committee (HJC) approved this bill in June. See, See, story titled "House Judiciary Committee Approves FISA Bill" in TLJ Daily E-Mail Alert No. 2,399, June 19, 2012. The HJC mark up revealed that Republicans tend to support the bill as reported by the HJC, while Democrats oppose it, or seek to amend it. However, there is some Democratic support for the bill, as well as some Republican skepticism, particularly from members with a libertarian streak of distrust of unchecked governmental authority. This warrantless "outside" of the US surveillance authority was enacted as part of HR 6304 [LOC | WW], the "Foreign Intelligence Surveillance Act of 1978 Amendments Act of 2008". It is Public Law No. 110-261. The 2008 Act provides that this "outside" of the US authority sunsets on December 31, 2012. HR 5949 and the Senate version, S 3276 [LOC | WW], would extend the sunset for five years, to December 31, 2017. In contrast, Rep. Conyers' amendment would have extended the Act through June 1, 2015. The Nadler Schakowsky amendment provided that "Not later than 180 days after the date of the enactment of this Act, the Attorney General shall make publicly available an unclassified summary of each decision, order, or opinion of the Foreign Intelligence Surveillance Court or Foreign Intelligence Surveillance Court of Review that -- (1) includes a significant construction or interpretation of section 702 of the Foreign Intelligence Surveillance Act of 1978 (50 U.S.C. 1881a); and (2) has been submitted to Congress under section 601(c) of such Act (50 U.S.C. 1871(c))." This section allows federal surveillance, without individualized court approval, under the FISA, of people believed to be outside of the US. More specifically, it pertains to "the targeting of persons reasonably believed to be located outside the United States to acquire foreign intelligence information". Finally, Rep. Scott's amendment, which he also offered at the HJC mark up, would expand reporting requirements. The 2008 Act provides that the "Attorney General and Director of National Intelligence shall assess compliance with the targeting and minimization procedures" and provide an assessment to the Foreign Intelligence Surveillance Court and the Intelligence and Judiciary Committees. See, 50 U.S.C. § 1881a, at subsection l. Rep. Scott's amendment would require that these assessments be "in unclassified form, but may include a classified annex". For more details, see stories titled "Senate Considers Bill To Extend FISA Outside the US Warrantless Wiretap Authority", "House Judiciary Committee Takes Up Bill To Extend FISA Outside the US Warrantless Wiretap Authority", and "Commentary: Warrantless Wiretaps and Senate Secrecy" in TLJ Daily E-Mail Alert No. 2,396, June 14, 2012. 9/10. The Executive Office of the President (EOP) released a statement regarding HR 5949 [LOC | WW], the "FISA Amendments Act Reauthorization Act of 2012". It states that "The Administration strongly supports H.R. 5949." This statement asserts that "Title VII of FISA allows the Intelligence Community to collect vital foreign intelligence information about international terrorists and other important targets overseas, while providing protection for the civil liberties and privacy of Americans." It adds that "Intelligence collection under Title VII has produced and continues to produce significant information that is vital to defend the Nation against international terrorism and other threats. The Administration looks forward to working with the Congress to ensure the continued availability of this critical intelligence capability." President Obama's policies regarding phone and internet surveillance are substantially indistinguishable from those of former President Bush. 9/10. A delegation from the People's Republic of China's (PRC) State Administration for Industry and Commerce of China (SAIC) visited the U.S. Patent and Trademark Office (USPTO) on September 10, 2012. Minister Zhou Bohua, USPTO Director David Kappos and others met for about four hours. The USPTO disclosed in a statement, written by Director Kappos and Mark Cohen, that "Minister Zhou toured USPTO headquarters, met on a government to government basis with USPTO and colleagues" from the Office of the United States Trade Representative (OUSTR), Department of Justice (DOJ) and Federal Trade Commission (FTC), and later met with representatives from the U.S. Chamber of Commerce, International Trademark Association (INTA), American Intellectual Property Law Association (AIPLA), Licensing Executives Society (LES) and the US-China Business Council. The USPTO stated that in recent years the USPTO and SAIC have discussed "training of examiners and translation of our Trademark Manual of Examining Procedure (TMEP) into Chinese; training on three dimensional and sound trademarks; exchanging information on protection of geographical indications; discussion of measures to deal with abusive trademark registrations; discussions on trademark dilution and well-known marks; training in on-line counterfeiting and IP infringement; and encouraging SAIC to develop an on-line trademark database including an English language search interface". Trade Secrets. The USPTO stated that "Minister Zhou was candid in acknowledging that theft of trade secrets affects Chinese and foreign companies alike and due to restrictions on evidence gathering and other compulsory measures by administrative agencies, SAIC’s administrative enforcement cases to date have been relatively modest matters brought mostly against small companies or individuals. Under current Chinese law, he believed that the courts and police are better equipped to handle complex trade secret theft cases." IPR and Antitrust. The USPTO stated that "SAIC also discussed the fifth draft of its guidelines on handling of IPR in antitrust matters. We urged that these guidelines will be available for public comment. On the substance, Minister Zhou did state that SAIC did not view intellectual property and antitrust law as contradictory concepts; both laws have a goal of promoting market efficiency and innovation. Minister Zhou advised that SAIC would only investigate licensing transactions that hurt competition, and that his agency has not yet had one case in this area since the law’s passage (2008), although it had prosecuted 16 antimonopoly enforcement cases. Minister Zhou welcomed the USPTO’s participation in this area, and noted that he was working closely with our colleagues from USDOJ and FTC on the IPR guidelines." The USPTO statement also addresses the Apple trademark dispute in the PRC, trademark pendency, and revisions to PRC trademark law. 9/10. The Senate confirmed Stephanie Marie Rose to be a Judge of the U.S. District Court (SDIowa) by a vote of 89-1. See, Roll Call No. 190. 9/10. The Government Accountability Office (GAO) released a report [51 pages in PDF] titled "Federal Communications Commission: Regulatory Fee Process Needs to Be Updated". 9/9. The Office of the U.S. Trade Representative (OUSTR) released a statement regarding the Trans Pacific Partnership Agreement (TPPA) meetings in Leesburg, Virginia, which run from September 6 through 15. However, it does not address intellectual property issues. The Computer and Communications Industry Association's (CCIA) Matt Schruers, who is attending, stated in a release that "If we increase international intellectual property enforcement without also expanding protections for Internet services and platforms, we will create an international system hostile to the export of Internet services, where the U.S. has an extraordinary trade advantage. We must ensure that we do not create a trade agreement that cripples one of our most successful industries." The Public Knowledge (PK) released a short piece by Jodie Griffin titled "Recap: TPP Stakeholder Events in Leesburg, VA". 9/7. The Department of Justice (DOJ) and other supporters of the respondent filed amicus curiae briefs with the Supreme Court in Kirtsaeng v. John Wiley & Sons, a case regarding whether the first sale doctrine of the Copyright Act applies to goods made abroad. The first sale doctrine, which is codified in the Copyright Act at 17 U.S.C. § 109, permits the owner of a lawfully purchased copyrighted work to resell it without limitations imposed by the copyright holder. However, another section of the Copyright Act, codified at 17 U.S.C. § 602, restricts importation into the U.S. of copies without the authority of the owner of copyright under the Copyright Act. John Wiley & Sons, the plaintiff in the District Court and respondent in the Supreme Court, publishes academic, scientific, and educational journals and books, including textbooks, for sale in domestic and international markets. It makes outside of the US those copies for sale outside of the US. It makes in the US those copies for sale inside the US. Wiley's books for non-US sale include statements such as "Authorized for sale in Europe, Asia, Africa and the Middle East Only" and "This book ... may not be exported." Supap Kirstsaeng, the defendant below and petitioner in the Supreme Court, imported into the US Wiley books published outside the US, and sold them on websites such as eBay. His revenues totaled about about one million dollars. Wiley sued Kirstsaeng in the U.S. District Court (SDNY), and won. Kirtsaeng appealed. The U.S. Court of Appeals (2ndCir) affirmed. Kirtsaeng petitioned the Supreme Court for writ of certiorari. Oral argument is scheduled for October 29, 2012. For a more detailed explanation of this case, see stories titled "2nd Circuit Holds First Sale Doctrine Does Not Apply to Works Made Abroad" in TLJ Daily E-Mail Alert No. 2,295, August 28, 2011, and "Supreme Court Grants Certiorari in Case Regarding First Sale Doctrine" in TLJ Daily E-Mail Alert No. 2,372, April 16, 2012. See also, brief of petitioner, Kirtsaeng, and brief of respondent, Wiley. Amicus Brief in Support of Respondent. Copyright holders, and the DOJ, filed briefs in support of the respondent, and for affirming the judgment of the Court of Appeals. The Office of the Solicitor General (OSG) wrote in its brief that "In the Copyright Act of 1976, Congress enacted Section 602(a)(1), which broadened protections against unauthorized importation of copyrighted works to encompass copies that are lawfully made. That provision was intended to facilitate market-segmentation measures of the sort at issue in this case." The Software and Information Industry Association (SIIA) wrote in its brief that the "Second Circuit correctly concluded that the first sale doctrine, as codified in section 109, did not apply to foreign-made copies imported into the United States by Petitioner." The SIIA added that "there are a variety of rational and widely beneficial reasons for a copyright owner to prevent copies made for sale abroad from entering the United States. Market segmentation has many salutary effects both for copyright owners and the consumer by providing incentives for the creation of new copyrighted works (made possible by foreign exploitation), lower domestic prices, expansion and investment in U.S. companies, and employment. In addition, the laws or economics of a particular foreign market may dictate the differences in the copies produced for that market." The Business Software Alliance (BSA) wrote in its brief [28 pages in PDF] that "The vitality of the software industry depends in large part on strong copyright protections. One of those protections is the right to choose to either authorize or prohibit importation of software into the United States, as set forth in Section 602 of the Copyright Act. Petitioner, however, contends that the Section 602 right should be subsumed by the first sale doctrine, such that software creators would be unable to prevent the distribution of foreign versions of their software in this country. That approach threatens harmful consequences to the software industry that Congress could not have intended and that cannot be reconciled with the text, structure, or purpose of Section 602. Instead, the public good is best furthered by the innovation and creative expression that is fostered when authors are given exclusive control over authorizing or prohibiting the distribution of their works." Amicus Briefs in Support of Petitioner. Amici in support of the petitioner filed their briefs on July 9. Google, eBay, Center for Democracy and Technology (CDT), Computer and Communications Industry Association (CCIA), and other groups wrote in their brief that the Second Circuit should be reversed because it "imposed a place of manufacturing requirement on the first sale doctrine that is directly at odds with the text, structure, history, and purposes of the Copyright Act." They argued that the Second Circuit's opinion could "have significant adverse con-sequences for trade, consumers, secondary markets, e-commerce, small businesses, and jobs in the United States". They wrote that "A place of manufacturing requirement will create incentives for off-shore manufacturing, stifle secondary markets, stifle e-commerce, harm small businesses and consumers, and further depress the job market in the United States." The American Library Association (ALA) wrote in its brief that "By restricting the application of Section 109(a) to copies manufactured in the United States, the Second Circuit’s decision threatens the ability of libraries to continue to lend materials in their collections. Over 200 million books in U.S. libraries have foreign publishers. Moreover, many books published by U.S. publishers were actually manufactured by printers in other countries. Although some books indicate on their copyright page where they were printed, many do not. Libraries, therefore, have no way of knowing whether these books comply with the Second Circuit’s rule." The Public Knowledge (PK), Electronic Frontier Foundation (EFF) and other groups wrote in their brief that "The Second Circuit’s interpretation of sections 109 and 602 is likely to have dangerous consequences for both consumers and businesses that operate in resale markets. The court’s reading of section 109 effectively removes a vast swath of copyright-protected goods from the well-established protections of the first sale doctrine. This precludes secondary markets for many goods entirely and creates substantial uncertainty for many other goods if the owner does not know where every copyrightable component of the product was manufactured. By extending liability for selling, lending, or otherwise disposing of lawfully purchased copies of copyright-protected works, the Second Circuit has exposed to legal risk a wide swath of activities, from holding a weekend garage sale, to selling a used car, to lending books to friends or patrons, to providing online platforms for reselling goods." 9/7. Federal Communications Commission (FCC) Chairman Julius Genachowski released a statement regarding a text to 911 trial in the state of Tennessee. He wrote that "This trial represents a significant step forward in migrating our traditional voice-centric 911 system to a next-generation system that will enable consumers in need of help to communicate with public safety responders by text as well as voice, and eventually to transmit photos, videos, and other data that will help improve emergency response." He added that next generation (NG) 911 "trials are already under way in Iowa, Durham, North Carolina, and Vermont. The Tennessee trial is the largest to date in terms of the population covered, and should provide valuable information that will help us to ensure that text-to-911 increases public access to help in emergencies and enhances the ability of 911 authorities and first responders to provide life-saving services." The FCC adopted a NG911 Notice of Inquiry (NOI) [36 pages in PDF] on December 21, 2010. It is FCC 10-200 in PS Docket No. 10-255. The FCC adopted a NG911 Notice of Proposed Rulemaking (NPRM) [81 pages in PDF] on September 22, 2012. It is FCC 11-134 in PS Docket Nos. 11-153 and 10-255. HR 3630, [LOC | WW], the spectrum bill enacted in February includes, at Sections 6501-6509, the "Next Generation 9-1-1 Advancement Act of 2012". 9/7. The House will return from its August recess on Monday, September 10. House Republican Leader Rep. Eric Cantor (R-VA) released the schedule for the House for the week of September 10 through 14. It includes HR 5949, the "FISA Amendments Act Reauthorization Act of 2012", HR 6215, a trademark dilution remedies technical corrections bill, HR 6131, a bill to extend the SAFE WEB Act, and SConRes 17, a resolution regarding participation by Taiwan in international organizations. Surveillance. The House will consider HR 5949 [LOC | WW], the "FISA Amendments Act Reauthorization Act of 2012", subject to a rule. This warrantless "outside" of the US surveillance authority was enacted as part of HR 6304 [LOC | WW], the "Foreign Intelligence Surveillance Act of 1978 Amendments Act of 2008". The House passed it on June 20, 2008. The Senate passed it on July 9, 2008. Former Sen. Barack Obama (D-IL) voted for it. Former President Bush signed it on July 10, 2008. It is now Public Law No. 110-261. The 2008 Act provides that this "outside" of the US authority sunsets on December 31, 2012. HR 5949 and the Senate version, S 3276 [LOC | WW], deceptively titled the "FAA Sunsets Extension Act of 2012", would extend the sunset for five years, to December 31, 2017. The House Judiciary Committee (HJC) approved HR 5949 on June 19. See, story titled "House Judiciary Committee Approves FISA Bill" in TLJ Daily E-Mail Alert No. 2,399, June 19, 2012. The House Intelligence Committee (HIC) reported this bill on August 2. The House Rules Committee (HRC) will meet at 5:00 PM on Monday, September 10 to adopt a rule for consideration of this bill. This rule is likely to make in order certain amendments. Some or all of the amendments offered but rejected at the HJC mark up on June 19 may be made in order during House floor consideration of the bill. This includes proposals to shorter the extension from five to three years, to require the Attorney General to publish summaries of opinions of the Foreign Intelligence Surveillance Court and Foreign Intelligence Surveillance Court of Review, to impose more reporting requirements, and to require an Inspector General report. Sen. Dianne Feinstein (D-CA) introduced S 3276 on June 7. The Senate Intelligence Committee (SIC) had previously approved the yet to be introduced bill in a secret session on May 22. The Senate Judiciary Committee (SJC) amended and approved this bill on July 19, 2012. The SJC added a provision for Inspector General reviews. The full Senate has not yet approved either the SIC or SJC version of this bill. See also, stories titled "Senate Considers Bill To Extend FISA Outside the US Warrantless Wiretap Authority", "House Judiciary Committee Takes Up Bill To Extend FISA Outside the US Warrantless Wiretap Authority", and "Commentary: Warrantless Wiretaps and Senate Secrecy" in TLJ Daily E-Mail Alert No. 2,396, June 14, 2012. Trademark Dilution. The House will consider HR 6215 [LOC | WW | PDF], an untitled bill to amend the Trademark Act regarding remedies for dilution. SAFE WEB Act. The House will consider HR 6131 [LOC | WW], a bill to extend the "Undertaking Spam, Spyware, And Fraud Enforcement With Enforcers Beyond Borders Act of 2006" or "SAFE WEB Act", under suspension of the rules. The House Commerce Committee (HCC) approved this bill on August 1. The Senate Commerce Committee (SCC) approved S 3410 [LOC | WW], a substantially identical bill, on July 31, 2012. See, story titled "House and Senate Commerce Committees Pass Bills to Extend SAFE WEB Act" in TLJ Daily E-Mail Alert No. 2,418, August 2, 2012. The Congress enacted the SAFE WEB Act in late 2006, with a seven year sunset. HR 6131 and S 3410 would extend the sunset until September 20, 2020. These bills are short, straightforward, and not controversial. Moreover, the 2006 SAFE WEB Act was not controversial either. However, the SAFE WEB Act conferred some broad powers on the Federal Trade Commission (FTC). For example, the Act gave the FTC power to compel third party service providers to disclose the contents of stored wire and electronic communications, without notice to the owner of the communications, and with a gag order imposed upon the service provider. Also, while the title suggests that this bill pertains to the web, it actually affects a wide range of investigations and actions by the FTC. Taiwan. The House will consider SConRes 17 under suspension of the rules. This resolution provides that "it is the sense of Congress that" the US "should take a leading role in garnering international support for the granting of observer status to Taiwan in the" International Civil Aviation Organization (ICAO). It also states that the US has "declared its support for the participation of Taiwan in appropriate international organizations". The Senate passed this resolution on September 21, 2011. The House Foreign Affairs Committee (HFAC) approved it on March 7, 2012. 9/7. Federal Communications Commission (FCC) released a tentative agenda for its event titled "Open Meeting", scheduled for September 28, 2012. The five Commissioners are scheduled to adopt three notice of proposed rulemakings (NPRMs). First, the FCC is scheduled to adopt a NPRM related to incentive auctions. Second, the FCC is scheduled to adopt a NPRM regarding "mobile spectrum holdings". Third, the FCC is scheduled to adopt a NPRM regarding its licensing and operating rules for satellite services. 9/7. The Department of Labor's (DOL) Bureau of Labor Statistics (BLS) released employment data for the U.S. for the month of August 2012. The BLS stated in a release that the seasonally adjusted unemployment rate in the US in August was 8.1%. This is a decrease from the 8.3% rate in July. The unemployment rate has held steady in the range of 8.1% to 8.3% this year. One notable recent trend is that the total number of persons employed in the category of "computer systems design and related services" is growing. It grew by over 10,000 in August. It also grew by over 10,000 in July. Source: BLS, September 6, 2012 employment report, Table B-1. While the overall unemployment rate reported by the BLS decreased from 8.3% in July to 8.1% in August, this reflects no improvement in the economy or the opportunities or welfare of individuals. The number of people with jobs decreased from 142,220,000 in July to 142,101,000 in August, a drop of 119,000. This follows an even larger decrease in the number of people with jobs from June to July -- 195,000. See, BLS Table A, titled "Summary table A. Household data, seasonally adjusted". Although, the first sentence of the BLS release states that "Total nonfarm payroll employment rose by 96,000 in August ..." So, did the number of employed persons decrease by 119,000, or increase by 96,000? It depends on which BLS data set is used. The government collects data from two sources -- households (surveys of individuals) and establishments (reports from businesses that employ people). The unemployment rate comes from the household survey data. The 119,000 decrease in employment also comes from the household survey data. The 96,000 increase in employment comes from the establishment data. See, BLS Table B, titled "Summary table B: Establishment data, seasonally adjusted". The reason that the BLS reported a drop in the unemployment rate (household data) when the number of people with jobs dropped sharply (household data) was that BLS reported an even bigger drop in the number of people in the workforce (household data). According to the BLS, the workforce dropped by 581,000 from July to August. When someone retires upon reaching a mandatory retirement age, or developing age related disabilities, that decreases the size of the workforce. There is a constant stream of retirements. On the other hand, people are constantly entering the workforce too. A drop of 581,000 in one month suggests either or both of two things: (1) that people are leaving the workforce because of the state of the economy and their inability to find employment, and/or (2) government surveyors and statisticians are changing their methods in ways that have the effect of reclassifying people from being in the workforce but unemployed, to being outside of the workforce. 9/7. The Department of Justice's (DOJ) Office of the Inspector General (OIG) released a report [44 pages in PDF] on Sentinel, the Federal Bureau of Investigation's (FBI) information and investigative case management system. 9/6. The Motion Picture Association (MPA) announced in a release that the MPA and Taobao Marketplace "signed a Memorandum of Understanding (MOU) to promote a healthier online environment in China for the sale and distribution of legitimate audio-visual content". Both the Motion Picture Association of America (MPAA) and the MPA have as members the large US based movie companies. Taobao is a web site in the People's Republic of China (PRC) that has features similar to both eBay and Amazon. The MPA did not release the MOU. However, it stated in its release that "Both parties have reached a common understanding regarding the importance of strengthening existing standards, mechanisms, and mutual responsibilities concerning the identification and removal of copies of MPA member company content from Taobao.com’s consumer-targeted e-commerce platform that the members have identified as counterfeit or otherwise infringing." The Office of the U.S. Trade Representative (OUSTR) stated in its December 20, 2011 report [6 pages in PDF] titled "Out-of-Cycle Review of Notorious Markets" that "Several commenters reported that pirated and counterfeit goods continue to be widely available on China-based Taobao. While stakeholders report that Taobao continues to make significant efforts to address the problem, they recognize that much remains to be done. Taobao was recently listed as one of the top 16 most visited sites in the world, and one of the top three most visited sites in China, according to rankings published at Alexa.com." The announcement of this MOU comes just before the comment deadlines in two OUSTR inquiries about the PRC's intellectual property record. Friday September 14 was the deadline to submit comments to the OUSTR in response to its notice in the Federal Register (FR) requesting comments to assist it in preparing its 2012 Notorious Markets List, which identifies internet and physical notorious markets located outside of the US that make available intellectual property infringing products. See, FR, Vol. 77, No. 157, August 14, 2012, at Pages 48583-48584. See also, story titled "USTR Seeks Comments on Notorious Markets" in TLJ Daily E-Mail Alert No. 2,431, August 17, 2012. See, for example, comments [8 pages in PDF] submitted by the International Intellectual Property Alliance (IIPA). It lists many online markets around the world, including some in the PRC, such as Sohu/Sogou (which "continues to operate an unlicensed deeplinking service"), Xunlei (which operates "unlicensed P2P file sharing"), Gougou (which operates "an unlicensed deeplinking service"), and Xiami (which "continues to operate its multi-platform infringing service in music portal, P2P application ... and mobile applications that actively induce users to search for infringing music files hosted on Xiami’s servers for streaming and download"). However, the IIPA did not mention Taobao, as it did in its 2011 comments for the OUSTR. Next Monday, September 24, is the deadline to submit comments to the OUSTR to assist it in preparing its annual report to the Congress on the PRC's compliance with its World Trade Organization (WTO) obligations. See, notice in the FR, Vol. 77, No. 161, August 20, 2012, at Pages 50206-50207. See also, story titled "OUSTR to Receive Comments and Hold Hearing on PRC Compliance with WTO Obligations" in TLJ Daily E-Mail Alert No. 2,431, August 17, 2012. 9/6. The Democratic National Committee (DNC) released a document [32 pages in PDF] titled "2012 Democratic National Platform". It contains statements about cyber security, internet freedom, the TPPA, STEM education and immigration, the R&D tax credit, spectrum policy, and intellectual property. See also, story titled "Republican Platform Addresses Tech Related Issues" in TLJ Daily E-Mail Alert No. 2,440, September 4, 2012. Cyber Security. The platform contains a description of cyber threats. It then states that "The President and the administration have taken unprecedented steps to defend America from cyber attacks, including creating the first military command dedicated to cybersecurity and conducting a full review of the federal government’s efforts to protect our information and our infrastructure." "We will continue to take steps to deter, prevent, detect, and defend against cyber intrusions by investing in cutting-edge research and development, promoting cybersecurity awareness and digital literacy, and strengthening private sector and international partnerships." It also states that "President Obama has supported comprehensive cybersecurity legislation that would help business and government protect against risks of cyber attacks while also safeguarding the privacy rights of our citizens." This is a reference to Sen. Joe Lieberman's (D-CT) S 3414 [LOC | WW], the "Cybersecurity Act of 2012". The bill has stalled in the Senate, and the House, which has already passed its own cyber security bill, will not now take up S 3414. See, story titled "Senate Rejects Cloture on Sen. Lieberman's Cyber Security Bill" in TLJ Daily E-Mail Alert No. 2,419, August 3, 2012, and stories titled "Senate May Take Up Lieberman Collins Cyber Security Bill", "Summary of S 3414", "Sen. McCain Criticizes S 3414", "Obama Calls for Cyber Security Standards Bill", and "Reaction to S 3414" in TLJ Daily E-Mail Alert No. 2,415, July 30, 2012. The Democratic platform adds, "going forward, the President will continue to take executive action to strengthen and update our cyber defenses." This suggests that President Obama may attempt to impose elements of the regulatory regime embodied in S 3414 by executive order. Internet Freedom. The platform states that "The Obama administration has led the world to recognize and defend Internet freedom – the freedom of expression, assembly, and association online for people everywhere – through coalitions of countries and by empowering individuals with innovative technologies. The administration has built partnerships to support an Internet that is secure and reliable and that is respectful of U.S. intellectual property, free flow of information, and privacy. To preserve the Internet as a platform for commerce, debate, learning, and innovation in the 21st century, we successfully negotiated international Internet policymaking principles, support the current multi-stakeholder approach to Internet governance, and oppose the extension of intergovernmental controls over the Internet." "President Obama is strongly committed to protecting an open Internet that fosters investment, innovation, creativity, consumer choice, and free speech, unfettered by censorship or undue violations of privacy." This platform provides no specific examples. It does not reference the FCC's BIAS rules. It does not reference the International Telecommunications Union's (ITU) upcoming "World Conference on International Telecommunications" or "WCIT", in Dubai, United Arab Emirates, in December. Nor does it reference intellectual property bills such as SOPA and PIPA. However, Rep. Jared Polis (D-CO) stated in a release that "The inclusion of an Internet freedom plank in the Democratic Party platform is the result of ... the leadership of a small group of remarkable colleagues in Congress who have never stopped fighting to prevent the passage of harmful legislation like SOPA and PIPA and other assaults on Internet freedom." Trade Agreements. The Democratic platform says nothing about the Obama administration's failure to negotiate, or even initiate negotiations for, any bilateral free trade agreements (FTAs). Nor does it advocate negotiating any bilateral FTAs in the future. It does reference the ongoing negotiation of the multilateral Trans-Pacific Partnership Agreement (TPPA). It states that the TPPA is a "high-standard agreement that will address new and emerging trade issues, lower barriers to the free flow of trade and investment, increase exports, and create more American jobs." However, the platform says nothing about the key intellectual property provisions of this agreement. STEM Education and Immigration. The platform advocates more spending on "science to educate the next generation of scientists and engineers". It also states that "we will work to make it possible for foreign students earning advanced degrees in science, technology, engineering, and mathematics to stay". Research Subsidies and R&D Tax Credit. The platform advocates "doubling funding for key basic research agencies"
It also advocates "expanding and making permanent the Research and Experimentation Tax Credit". The most recent extension of the R&D tax credit expired on December 31, 2011. Numerous bills are pending in the House and Senate that would modernize and extend, or make permanent, this tax credit. Spectrum Auctions and Broadband Regulation. The platform states that "We will ensure that America has a 21st century digital infrastructure – robust wired and wireless broadband capability, a smarter electrical grid, and upgraded information technology infrastructure in key sectors such as health care and education. President Obama has committed to ensuring that 98 percent of the country has access to high-speed wireless broadband Internet access. We are finding innovative ways to free up wireless spectrum and are building a state-of-the-art nationwide, interoperable, public safety network." It also states that "President Obama is strongly committed to protecting an open Internet". The Federal Communications Commission (FCC) adopted open internet rules [194 pages in PDF] in December of 2010, which are now under review by the U.S. Court of Appeals (DCCir). Intellectual Property. The platform states that "The administration is vigorously protecting U.S. intellectual property -- our technology and creativity -- at home and abroad through better enforcement and innovative approaches such as voluntary efforts by all parties to minimize infringement while supporting the free flow of information. Customs seizures of counterfeit drugs are up 600 percent and seizures of fake consumer safety and critical technology have increased nearly 200 percent; the Department of Justice has aggressively prosecuted the illegal overseas transfer of trade secrets. As technology advances, we will continue to work with all stakeholders to protect the security of the nation and its knowledge assets, U.S. intellectual property, the functioning of fair and competitive markets, and the privacy, free expression, and due process rights of Americans." Chris Dodd, head of the Motion Picture Association of America (MPAA) stated in a release that "I am extremely pleased that the Democratic Party’s platform language reinforces the critical importance of protecting America's intellectual property while ensuring the free flow of information on the Internet." "Protecting that source of creativity, as well as protecting the rights of the people behind that creativity, is integral not just to our economy, but to who we are as a nation", wrote former Senator Dodd. He added that "Through their platform language, both parties have now clearly stated that protecting the free flow of information on the Internet and protecting American innovators are not mutually exclusive goals -- and that in fact, they are equally critical. That kind of insightful approach to this 21st century challenge from both parties is encouraging, and I look forward to continuing to work with everyone who is invested in these issues to develop meaningful solutions to protect an Internet that works for everyone." Sandra Aistars, head of the Copyright Alliance, stated in a release that "We welcome the Democratic Party platform which reflects the Democratic Party’s consistent support for protecting intellectual property and promoting the arts, while also recognizing that a free and open internet is in the best interest of all. The platform is consistent with our call to the Democratic Platform Committee that it ensure that the two important principles of free expression and protection for authorship remain intertwined in American law and policy as they have been for the past 225 years and recognize that the protection of intellectual property is an essential element of a free and democratic Internet ecosystem." 9/6. The U.S. District Court (SDNY) released its Opinion and Order [48 pages in PDF] in U.S. v. Apple, approving the settlement agreement between the US and the settling defendants, Hachette, HarperCollins, and Simon & Schuster. This is a defeat for Apple. This is the Department of Justice's (DOJ) Antitrust Division's Sherman Act case filed in April against Apple and five e-book publishers. The complaint alleges that Apple and five publishers violated of Section 1 of the Sherman Act, 15 U.S.C. § 1, by conspiring to increase the prices that consumers pay for e-books. Three publishers settled with the DOJ in April, while Apple and two other publishers continue to contest the action. See, April 11 complaint [36 pages in PDF] and proposed final judgment (PFJ). See also, stories titled "DOJ Sues Apple and Book Publishers Alleging E-Book Price Collusion" and "Analysis of DOJ's Sherman Act Claim Against Apple and E-Book Publishers", and related stories in TLJ Daily E-Mail Alert No. 2,368, April 11, 2012. Under the Tunney Act, 15 U.S.C. § 16, these settlements must be published, open for public comment, and then approved by the District Court. Apple opposed the settlement, both in the District Court, and in the court of public opinion. Apple is not a party to the settlement. However, the PFJ requires the settling publishers to terminate certain contracts with Apple. Also, this Tunney Act settlement approval gave the non-settling defendants a first opportunity to argue the merits of the underlying case. The District Court not only approved the PFJ. Its analysis rejects some of the arguments advanced by Apple in opposition to the underlying antitrust claim against it..
See, Apple's comment [9 pages in PDF] and August 15 opposition to motion for entry of judgment. See also, story titled "Update on DOJ v. Apple eBooks Case" in TLJ Daily E-Mail Alert No. 2,437, August 25, 2012. The Tunney Act requires that the District Court determine whether the PFJ is "in the public interest", which includes consideration of the "competitive impact of such judgment". The Tunney Act does not require the District Court to hold an evidentiary hearing. Rather, the District Court makes its ruling based upon the complaint and the PFJ. The District Court wrote that "the Complaint alleges that the defendants conspired to raise, fix, and stabilize the retail price for newly-released and bestselling trade e-books, to end retail price competition among trade e-books retailers, and to limit retail price competition among the Publisher Defendants in violation of Section 1 of the Sherman Antitrust Act." It continued that entry of the PFJ "is appropriate" because it "secures a remedy that is closely related to the violations alleged in the Complaint. Whereas the Complaint alleges unlawful communications and industry collusion that gave rise to a series of agreements designed to ensure defendants’ use of agency pricing for e-books, the proposed Final Judgment disallows such communications and unravels both the Agency Agreements and agreements with other e-book retailers implementing the broader shift to agency pricing." "The two year limitation on retail price restraints and the five year limitation on Price MFNs appear wholly appropriate given the Settling Defendants’ alleged abuse of such provisions in the Agency Agreements, the Government’s recognition that such terms are not intrinsically unlawful, and the nascent state of competition in the e-books industry. The Government reasonably describes these time-limited provisions as providing a “coolingoff period” for the e-books industry that will allow it to return to a competitive state free from the impact of defendants’ collusive behavior. The time limits on these provisions suggest that they will not unduly dictate the ultimate contours of competition within the e-books industry as it develops over time." The Court also noted that "The Government and critics of the settlement dispute whether the decree effectively disallows agency pricing and therefore dictates a particular business model. The Court states no opinion on this issue as it is largely semantic and irrelevant to the disposition of this matter. The terms of the decree speak for themselves: they disallow restrictions on retail discounting for two years subject to certain limited exceptions." The Court also wrote that while the DOJ "did not submit any economic studies to support its allegations, such studies are unnecessary." The District Court concluded that "The Complaint alleges a straightforward, horizontal price-fixing conspiracy, which is per se unlawful under the Sherman Act. ... The Complaint also details the defendants’ public statements, conversations, and meetings as evidence of the existence of the conspiracy. The decree is directed narrowly towards undoing the price-fixing conspiracy, ensuring that price-fixing does not immediately reemerge, and ensuring compliance. Based on the factual allegations in the Complaint and CIS, it is reasonable to conclude that these remedies will result in a return to the pre-conspiracy status quo. In this straightforward price-fixing case, no further showing is required." 9/6. Amazon, maker of Kindle e-book readers, and Kindle Fire multipurpose reader/tablet devices, announced new product offerings and prices. See, release and release. Amazon is now offering a version of its Kindle Fire for $159, down from $199. The Fire had previously been priced at 40% of the price of Apple's cheapest iPad, which sells for $499. Amazon also announced a new line of dedicated reader devices. Also, it might be noted that while Apple enthusiasts and best selling authors may assert that the Department of Justice's (DOJ) Antitrust Division is unduly harassing Apple and its business model with antitrust litigation, Amazon enthusiasts also have cause for asserting that the DOJ's Civil Rights Division (CRD) is unduly harassing Amazon and other makers of e-book readers with Americans with Disabilities Act (ADA) based enforcement actions. See, for example, DOJ August 29, 2012, release announcing its settlement with the Sacramento Public Library Authority regarding its use of Barnes & Noble's Nook e-book readers. See also, story titled "DOJ CRD Regulates eBook Reader Designs" and related stories in TLJ Daily E-Mail Alert No. 2,080, April 26, 2010. While CRD personnel rhetorically assert authority under Title III (regarding public accommodations) of the ADA to regulate e-book reader makers, such assertions are weak. Moreover, these companies would have the resources to contest a DOJ action. Hence, the CRD has not sued Amazon, Barnes & Noble, or other makers of e-book readers. Rather, the DOJ pursues third parties against whom it can often rely upon Title II (regarding state and local governments) of the ADA. 9/6. The U.S. District Court (DC) sentenced Joshua Schichtel to serve 30 months in prison for violation of 18 U.S.C. § 1030 in connection with his sale of access to botnets. 9/6. Federal Communications Commission (FCC) Commissioner Ajit Pai gave a speech in Oswego, Kansas, regarding broadband deployment in rural areas. 9/6. The Federal Communications Commission (FCC) released a Notice of Apparent Liability for Forfeiture and Order (NAL) [12 pages in PDF] that fines St. George Cable, Inc. for among other things, signal leakage. This NAL states that St. George failed to "(1) install and maintain operational Emergency Alert System (EAS) equipment, (2) operate its cable system within required signal leakage limits, (3) immediately suspend operations as directed by a Bureau order and resume operations only with written authorization, and (4) register its cable system with the Commission." This NAL is FCC 12-99. 9/6. The National Institute of Standards and Technology's (NIST) Computer Security Division (CSD) released its draft SP 800-88 Rev. 1 [57 pages in PDF] titled "Guidelines to Media Sanitization". The deadline to submit comments is November 30, 2012. Go to News from September 1-5, 2012.